The poster for Poor Papa. 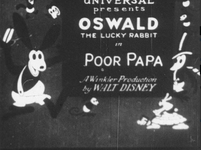 Poor Papa is the first Oswald The Lucky Rabbit short, created in 1927 by Walt Disney. 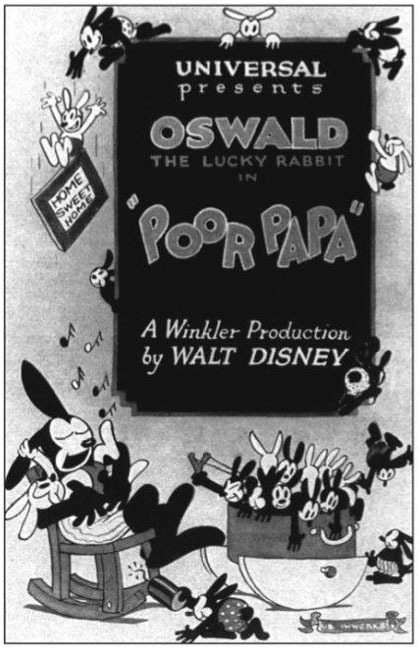 In this short, Oswald gets a visit from a stork who continues to drop babies into his chimney at a rapid pace. There were three copies known to exist. The first copy was sold in 2001 for a decidedly small fee of $100; the second copy was sold for £170, and the third copy was sold in 2014 for $7,500. 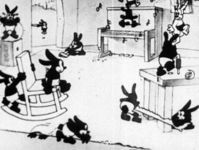 None of them had been ripped from the Internet, and the cartoon was not aired on television because of it, allegedly, "wasn't high-quality enough." It seemed that the copies sold only included 3 minutes of the short (a bit less than half of it), so the rest of the short was thought to have been permanently gone. On January 31, 2017, Poor Papa was released in full as a bonus feature on the Blu-Ray release of the Disney classic film Pinocchio. The short's total length is 5 minutes and 17 seconds. 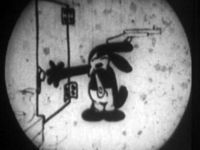 It was reported that it was restored from a scan of a 16mm silent home print in the UK. It also has a new music score. The full short ripped from the Blu-Ray. ↑ An article that has the info about the short's release. Retrieved 15 Dec '17.